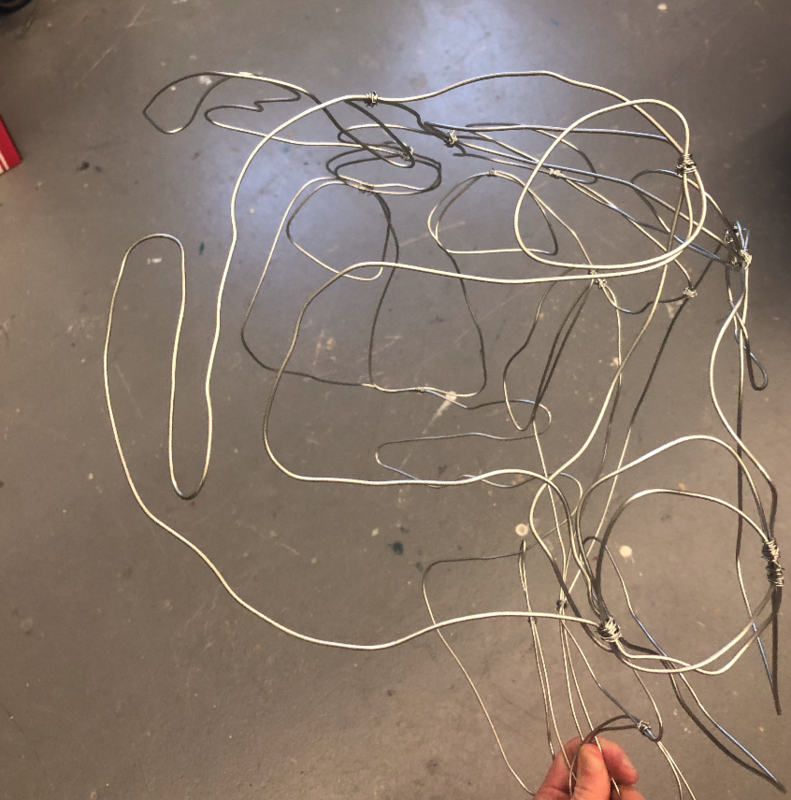 We had a short studio day today so I did not get much done, but I was able to secure some of the faces together with a thinner wire to make a stronger base. I'm pretty proud of where I am right now and I really like what I chose to do because there isn't really a way for me to 'mess up' since it's an original style and idea. I have about 3/5 of the circle formed and so far it's been an easy process. I've been working on forming the sphere of faces and trying to get the base layer done. It's hard to take pictures of my sculpture because it's a confusing piece and kind of all over the place right now. I decided that I am going to add another layer of faces on stop of this base layer. A lot of my play pages have been surfaces covered with too many little faces to count that, from far away, just look like scribbles. 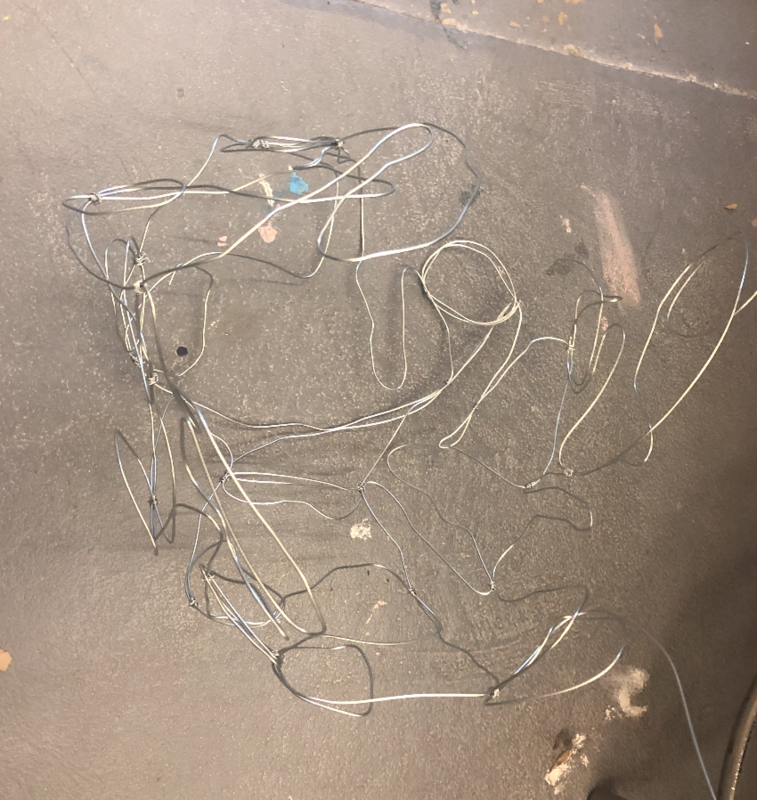 My goal with this piece is for it to just look like a ball of wire but when people get closer to the piece they see all the faces. Once I finish forming the sphere I'm going to go back through with a thinner wire and add little faces in between the base ones. 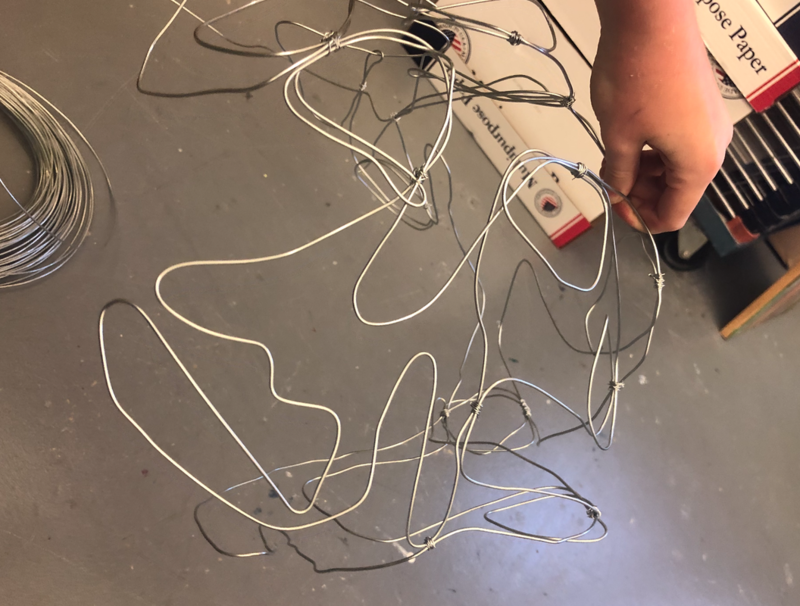 I haven't decided if I want to spray paint the base layer one color (most likely white if I do end up doing that) to make the smaller wire pop out. We'll see. So far I don't really know what I'm doing. I started my project knowing what I wanted to do content wise, because all of my play pages focus on the same idea. My play pages are mostly one line faces (made of many different materials) that are my interpretation of humans emotions and what you can't tell based on what you see on the outside. I didn't know how to turn these extremely 2D pieces into a sculpture, but I decided to attempt something that I still am not sure is gonna work out or not. Sometimes when I draw one line faces I use the eye of one face as the eye of another face, so they kind of connect. My sculpture is kind of taking that idea and running with it. To describe it in a basic way it's pretty much going to be a ball of confusing faces. The eye of one face is going to fold back to be the eye of another face and so on. I want it to be like my sketchbook cover, where from far away it just looks like a mess but when you look at it closely you can see all the faces. I don't really have a way to plan what I'm going to do with this because I typically freehand all the one line pieces I make anyways, but with this its slightly more complicated. I don't know if its going to work and it might take a few tries but I'm excited to see where it goes. I've experimented with making videos before, obviously nothing to this extent though, because it has always intrigued me and I love editing videos. Whenever I go on trips I take little videos of anything and everything and in the end when I get home I put them together with music (to me, its extremely satisfying). I want to look more into it to see what else I can create, and I love what Sasha Water Freyer had to say about it. Her job connects with her passion, but it's also like a hobby for her. That scares me a little because I feel like I would slowly lose the time to edit all of the film and then eventually just stop making them. All of her work are long projects created over a long period of time, which i think is really cool because your vision.goal can change so much during that time, but you also get such a long time to think about it so in the end it really is what you wanted. She runs into issues that the majority of people have issues with (finance, time, etc). I also love her emphasis on studying what you're passionate about. A lot of people, especially people my age, gravitate towards what their friends are doing, are pressured from their parts and do what they want, and/or don't even know what they want to do (which is me). That's all understandable, and I know at some point I'll find what I want to do, but some people don't ever plan on abandoning their parents dream for their own, which is terrible life to live because you won't succeed without doing something you don't love. I was intimidated by this project going into it mostly because I've never done anything like it. Even after my two practice paintings I still didn't know what I wanted to do. There were so many options as to what I could do with the paint I was just overwhelmed. I thought I had a picture in my head of what I wanted but I ended up doing something completely different. I had a handle on what I wanted by first layer to be, so that was a simple process. After see what it looked like when i started one of my practicing paintings (the one that I took the most inspiration from for my final piece) with a base color straight from the can I knew that that was something I did not want to do. I feel like it kind of ruined the painting, especially because you can see it on the edges (which is something I really don't like about my final painting but I'll probably just leave it be). ​ After painting that layer I started with the charcoal, which was just a bunch of large marks (some random and some more geometric) that I threw on the piece. I knew I wanted to add the white, thicker paint but I never really thought about how I was going to do it with the charcoal (going around it versus going on top of it). I started with just going around it and trying to blend it, which ended up working in the end but it wasn't giving the blending effect that I wanted and I didn't like how it looked. The only reason I liked it was because of the colors. However, after going in with my final layer I started liking how it looked. I didn't get the blood red color I wanted but because of how I mixed the color i had a lot of extra black which ended up being a good mistake. I applied the red/purple color and blended it with black on the painting, and I did the same thing with the blue (that was the same color as my first layer). I feel like its kind of simple because its the same thing all throughout the painting, but I really like how it turned out even though it wasn't what i was expected. Judith Godwin was born in Suffolk, Virginia where her art career was strongly supported by her parents, especially her father who had a career in architecture and landscape gardening. She attended Mary Baldwin college in 1950, and it was not until 1953 that she moved to New York and enrolled at the Art Students League. 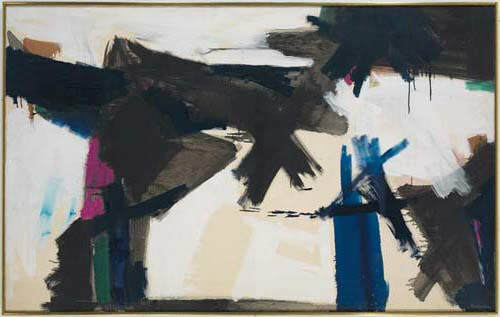 She trained under Hans Hofmann, eventually beginning to associate her art with the new Abstract Expressionist movement, developing a dynamic style in which she emphasized loose geometric forms and a prism of color. Towards the end of the 1950s Godwin began to develop a much harsher tone in her work, she stated, "“if you were a [woman] painter . . . you had to paint as strongly, as violently as the men did." ​ During the 1960s she toured around the world and picked up influence for her work from multiple different countries such as France, Spain, Italy, India, and Egypt. It was during this time period that Judith Godwin began experimenting and expanding her work. She formed an interest in interior design, soon becoming an apprentice to a plasterer, carpenter, and a mason. She even began following in her father's footsteps with landscape gardening while creating Abstract Expressionist pieces for a New York fabric house. In the 1970s and 80s her work increased in complexity as she started to combine structure and 'spontaneity'. She used processes such as stencil applications to create petal like forms, while also adding metallic and pastel paints to keep the work interesting. Judith Godwin continues to explore and grow as painter today. It is said that after painting for so many years she formed the patience that many artists lacked. She knew how to use paint but was and still is always willing to expand her repertoire and try something new. 1. Based on what you have observed from looking at both Judith Godwin's and Hans Hofmann's works, what are some techniques you think she picked up from Hofmann after training under him? What are some key similarities/differences in their work? 2. Godwin was mostly surrounded by male artists in the Abstract Expressionist movement, how do you think this impacted her work? ​ 3. Judith Godwin constantly traveled and explored new types of art, why do you think it was important for artists to travel and explore different countries and practice new techniques? This was an interesting process. I realized that my masters mark was easier to recreate than it was to copy because trying to perfectly replicate freehanded scribble-like marks is extremely difficult. When I started it was a lot less difficult than I thought it was going to be and I was able to get the whole hand and arm done in one sitting. My favorite part of the portrait is the hand, I feel like I really recreated my master's mark successfully. Throughout the process my face was kind of terrifying and I still think it kind of is but it got a lot better when I fixed the way the mouth curved, the height and angles of the eyes, and the length of the nose. I am pretty proud of my portrait for having never done portraits before but I don't love it. The Clown: I love the bold colors in this piece that almost appear like they have been spray painted because of the faded edges. There aren't many small loose marks which is pleasing to look at in comparison to many small marks. Its not overwhelming to look at which makes it more of an unexpected piece for me. The powerful marks and bold colors are different than a lot of the other works I've seen. Mountains and Sea: The color palette of this piece is beautiful. I love the layering and the appearance of water color with the difference colors and lines. 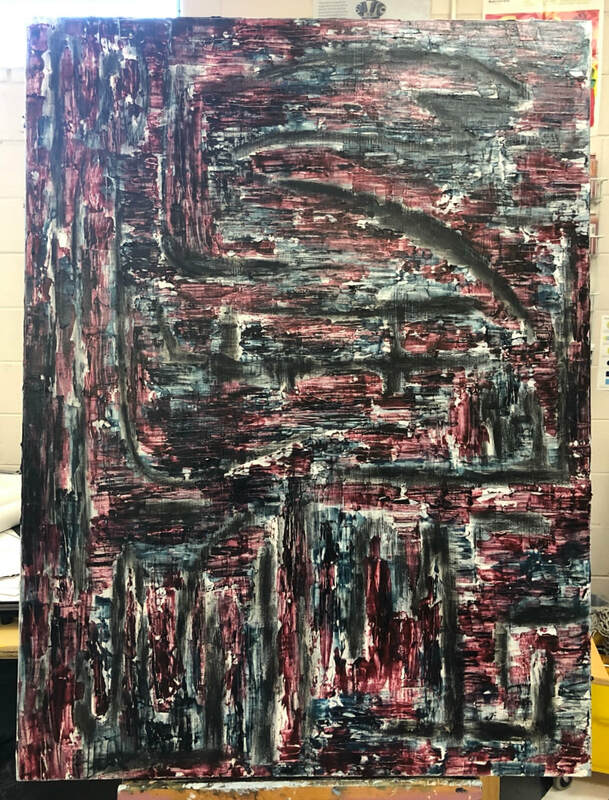 This piece makes me debate whether I want to focus more on bigger brush strokes or having colors bleed from smaller marks. The marks are a lot more sporadic and random than the others, and the use of texture adds another effect to the painting. I love the application of the paint and the way it appears splattered but blended at the same time. The room fill with Alexander Calder pieces left me in awe. I could have stayed in there for the longest time and still been intrigued by his work, I only wish I could have gotten closer to it (as most of it was in the air and too far away for me to see the little details) After seeing this room I have so many ideas of materials I want to work with and directions I want to go in but I am not sure exactly how to. I don't have a picture of it here, but the animal sculptures made from sheets of metal were beautiful and something I want to explore. ​Aztec Josephine Baker: I LOVE the hands on this piece. The medium is something I want to explore further and practice with, along with the style. He somehow makes the figure so simple but captures all the necessary details. The curves of the legs and body are so basic but perfect and I love it. Its not all completely attached so it is not truly one line but it gives the appearance. The presentation of the piece adds to it because of the shadows on the wall. Cow: This piece is so detailed but also so simple and it amazes me. I want to learn more about his process and how he creates such small bends and loops in the wire and what exactly what materials he uses. Consequence: ​ This isn't Alexander Calder or actually one line but it still inspired me. The layers of broken lines is something I want to explore with my play pages. My play pages have become really specific and repetitive and I want to branch out from it (even though I love it). I really want to paint and I think this would be a good approach (painting with multiple lines and just letting loose with it). I feel like incorporating a style like this in my ABEX piece would be beautiful. I chose this image for my self portrait mostly because of the lighting, that will work well with my old master's style of shading, and the foreshortening with the hand that I feel will turn out really will with Delacriox's style. I am nervous for the face because it is a full face image which contrasts with my original piece by Delacroix which was only a simplistic profile. I ran into a lot of issues with the face especially because it is sideways. For most of the process my face looked okay when looking at the drawing the way it is suppose to be, but when I turned it and looked it vertically the face was kinda terrifying. It took many tries to fix and I ended up lowering the eyes a lot and fixing the angle and in the end I still feel like my forehead is kinda massive (because I lowered the eyes so much) but I think it ended up pretty okay. I still think I look a little terrifying but I am really proud of the hand. I think I did a good job matching my masters mark with that specific part of the drawing. Howardena Pindell changed the purpose of her work while keeping the same undertone of a particular style in each of her pieces. While she changed her media frequently, she kept the sporadic yet purposeful placement of elements as a theme in each of her series. Each section (Memorist, Traveler, Activist, and Scientist) connects to a part of her life and allows her work to develop with her while also giving a detail explanation as to why. Her work developed with what was going on in her life, like her accident in 1979, to what was going on in the world that inspired her more 'social justice' like pieces. Separating her work into four sections allows the audience to absorb the deeper meaning in each art piece. For example, I was captured by Pindell's DNA piece because of the connection to her memories and the importance of the hands (as they are what creates the art and part of one's identity because of their unique fingerprint) With the work organized into a section, Memorist, I formed a better understanding of the piece and its purpose after learning about her accident and why she felt the need to make the pieces based on herself as an entity. Each section shows her development as an artist and separates it into broad stages. Studying her work shows other artists how your art will change based on what is going on in your life. While that could mean a change in subject it could also mean a change in medium or style or purpose, for example her pieces in The Shape of Numbers series versus pieces such as Autobiography: Air (CS560) . Bringing your work back to yourself and allowing it to change with you as you develop as a person is what Howardena Pindell is expressing in her different series and it what other artists should be encouraged to do. ​Her work had many striking aspects to it, which led it cover many Artist Habits of Mind. The few that stood out to me were Engage & Persist, Envision, and Express. Her art always sprouted from personal interest or the message she wanted to leave on the art world. With mixed media pieces she created many activist pieces that strongly expressed her opinions on different issues at the time. She created abstract pieces that seemed slightly chaotic but every single one of them had a method to their madness. The way she made art was so creative in itself and the way she managed to put such a powerful meaning behind all of her pieces makes it so much more awe-inspiring. Most of the steps of the Artist Process can be found in her pieces. The information given about each piece and section of work show the inspiration behind the piece which explains the main focus. There's not much present evidence of planning in her work, which is the only step of the process that isn't evident. The creation of her work is what is displayed on the wall, specifically zoning in on the use of each material and how she manipulated it. Lastly, the reflection of her own work is shown thought the following pieces and what she learned from her different experiments with different medias and techniques. My own work recently majorly changed. I currently have many series planned that I hope will express a deeper meaning (one that I formed based on what is going on in my own life). However I do make a lot of work that is simply me messing with a pen and nothing more, but I find satisfaction in having an aesthetically pleasing piece or just an image that pleases the mind without having to think of the meaning behind it. Part of my current work connects to the meaningful series-style of Pindell but the other half contrasts to what was displayed in the museum. These two above images contrast as one falls into the category of abstract expressionism and the other is none objective. The Abstract Expressionist piece has expression and meaning shown through the brush strokes and purposeful mark making done by the artist. The none objective piece had an aesthetic goal, but it is not expression a specific emotion or scene. 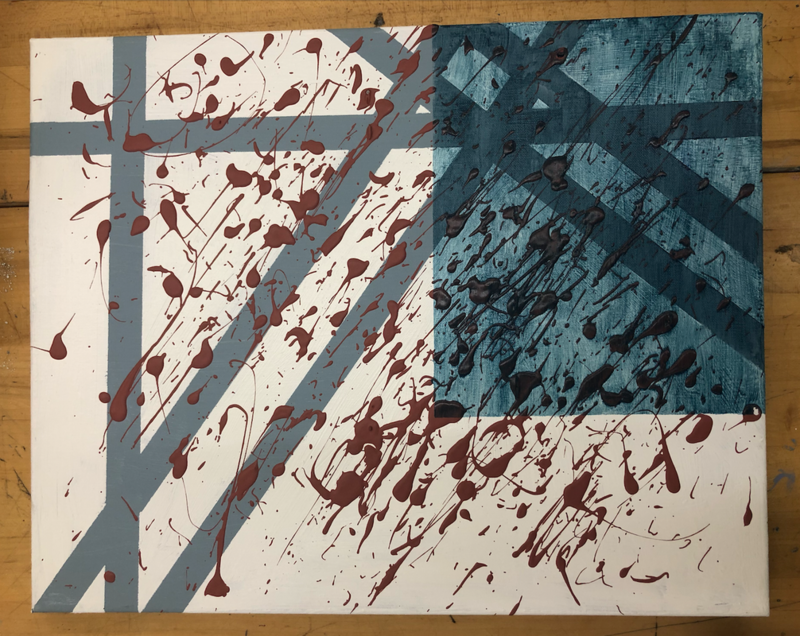 Abstract Expressionist work shows the relationship between the artist and the canvas and how the artist interacted with it. These pieces often have an assortment of colors, especially color-field works.. This piece has obvious motion and mark making with each brush stroke. It is a dynamic piece, and each mark has a specific and meaningful purpose. Each of these pieces has blatant mark making and movement. The piece by Jackson Pollock holds a story because of the layering and how the lines flow dynamically. The Twombly piece holds a story in because of the lines and how they draw your eyes to other parts of the board in order to put the piece together. Lastly, the Gorchov work shows large brush strokes that were most likely made from the shoulder. They seem slower than the Pollock painting, mostly because it is acting as a background and does not have a point to being more complex. Lastly, these images above show the artists process and goal through the elements of art and the principles of design. Each piece has line, color, and mostly likely a suggested form. Each of the principle designs can be used in every piece because it is what makes a piece different from the others.